Remember that What Am I? feature where we showed a picture of a car under a pile of rubble and after somebody solved the puzzle everybody in unison say, "a what?" Yeah, this is one of those. The rarest of the rare, a car that was so terrible that it has been collectively scrubbed from the minds of the world's car folks in some kind of mass post traumatic stress-amnesia. 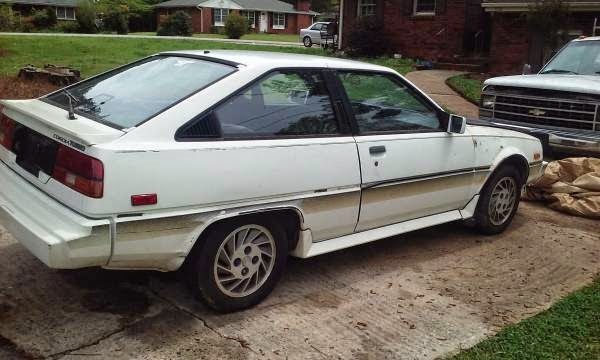 Find this 1988 Mitsubishi Cordia offered for $600 in Fayetteville, GA via craigslist. Tip from FuelTruck. The Cordia was one of the three cars first sold in the USA when Mitsubishi launched its attack on the US market (along with the Starion and the Tredia) in 1982. Aside from some of the most bitchin' wheels (what are those called, salad shooters?) this side of Saab's Inca alloys, the Cordia didn't have much going for it. Under the hood is a 135 horsepower 4G62 turbocharged engine with 5-speed manual gearbox mated to the front wheels. About the only thing this Cordia has going for it is that you will be the only one on the block...city...state...universe..multi-verse with one. Perhaps this car is the corollary to 17th century Dutch philosopher Baruch Spinoza's theory that all things excellent are as difficult as they are rare, but why take the word of some dead dude? Go buy this Cordia yourself and find out. Mitsubishi had, at that point, the Cordia and the Tredia, I figured whoever was naming their cars was making a tire joke. Apparently they canned him before we were subjected to the Beltia and the Beadia. @mrkwong - thanks for a Monday morning laugh! Actually I do remember the Cordia, but only because I scored a pair of mint front seats from one for my BMW 2002 project car. I've talked about the Cordia here on DT before so I'll try not to repeat. But, I will say that in my opinion Mitsubitchie wishes they had cars like the Cordia and Tredia on dealer lots right now. They're heading the way of Isuzu, rapidly. They're up the creek with nothing in the future other than yet another CUV that looks just like the last one. And who wants the Mirage? But the Lancer, you say! Dead dead dead. Old news and nothing on the horizon. Back when they had the Cordia and Tredia, believe it or not, those models were volume sellers. For the company, they sold a lot of them. I don't have the stats in front of me but I recall them being some of the best sales years of all time for the company. And now they have nothing. Our featured 1988 (last year of production) stickered for around $12K and weighed 2458 pounds. A comparative Z24 went for around $11K and weighed another 100 pounds. In 1983, a Cordia LS went for $9450. There were some really interesting technologies going on in the Cordia/Tredia that all rally kooks and Evo-ites should know about; there was a crude 4WD system (nowhere as sophisticated as what Subaru was doing) available. I've seen no evidence that this option made it overseas to us here in the States, though. I'm sure there have been some conversions, somewhere, as well as the obligatory triple-turbo 454 nitrous-ed swaps. But what did make it was the "Super Shift", which was a twin stick with 8 forward gears. Most DTers will recognize this transmission from the contemporary Mirage/Colt. So what went wrong? I think the main problem was that they fell between the cracks in terms of they weren't super cheap but they also weren't expensive at all. So they became completely disposable, helped no doubt by a tendency to rust merrily. They weren't built to a high standard and the bits and pieces that started to go pear shaped would cause an owner to just move on to another purchase. That's the way it went back then, kiddies. And you had to do an oil change every once in a while; not like now, brown cow. But surely the real kicker were the insurance rates. For whatever reasons (it seems like voodoo to me), the insurance companies figured that these cars were bad risks and rates were through the roof. That's another reason why I didn't buy one at the time. Could you imagine, a Fiero for goshsakes was cheaper to insure! Same with the XT, if I recall correctly. It probably had to do with the OEM turbo stickers on the Japanese(ish, in the case of the Cordia and Tredia) cars. Back to the pricing. Don't forget that in 1983, you could walk into any Honda or Nissan dealer and walk out with a sporty model (not including the Z of course) for less than the Cordia...yeah. Accordiangly, this would have been a better investment. Commence groan...now. I love storytime: A teacher in middle school had the "Enigma" Sigma. Maroon, Power Everything and heavily bolstered velour. I ran into her a few years back and asked if she still had it. She told me she got rid of it when it started having sensor/vacuum problems. You gotta love an underdog. What always fascinated me about Mitsubishi from the 70s through the early 90s, is that they weren't afraid to pour as much tech into their products as humanly possible. They paid the price but some of the best J-Tin came from the boys that gave us the legendary Zero. I bought this car! LOL! Just pulled the engine today to rebuild it. Needs allot of mechanical work, but i should have it up and running sometime this year. Engine will start going back together this weekend. FYI, the engine has taken ALLOT more thus far than a "coil". Finding parts for this car is hard as hell. I have a set of used timing covers coming from Australia. New exhaust manifold? LMAO. Good luck. After I am done with this I am planning on a DOHC 4g63t engine with megasquirt2. Wow, are you stubb... I mean determined, and resourceful. I promise to click on all your future updates re this car. Rebuilt engine is back in the car! FYI, the car now runs and drives. It had it's fist start today and working all the issues with leaks and such. Sounds damn good too! Robert hale are u still have the cordia for sale ? Jvicente1681@outlook.com email me if still have it . I still have this car and it still runs and drives yet nobody here has followed up with me about what it took to get this car on the road.